While in most cases this rule of thumb may hold true, in India – or, Delhi, to be more precise – there is such a thing as a free cigarette – or 40. No, tobacco leader ITC haven’t turned charitable overnight. Rather, a perfect storm consisting of farmers burning crops in the northern states of Haryana and Punjab, week-long Diwali fireworks celebrations, and low wind speeds is playing out. TV adverts caution that eight hours spent outdoors in the absence of a face mask is equivalent to smoking 40 cigarettes. Having never smoked a cigarette in my life I thought it an opportune time to make a trip to an investment conference in Delhi & Gurgaon, followed by site visits in Bangalore. On reflection, the smoke should really not come as a surprise, given that the Indian stock markets have been on fire: +25% year-to-date, and +30% since PM Modi launched his anti-corruption drive through what is now universally known as ‘de-monetisation’. While the execution has come under criticism for being highly disruptive for lower income and rural populations – not to mention that 98.96% of the value of notes invalidated has been formally returned – an important unintended consequence has been the financialisation of savings. Anecdotally, my discussions with shopkeepers, Uber drivers and hotel staff suggested an increasing allocation towards mutual funds, while empirically year-to-date domestic equity funds inflows have spiked to US$17.9bn. However, and more interestingly, the growth is coming from outside of India’s top 15 cities, which now account for 17.9% of industry asset under management, versus 16.6% a year ago. What does India look like through the 4FactorTM lens? Through our lens it is apparent that share prices, to a certain extent, have decoupled from fundamentals. For example, the NIFTY and SENSEX are making lifetime highs and trading at >1 standard deviation vs. 10-year average valuation multiples, at a time where earnings revisions have been negative in six of the last eight quarters and returns on equity are at 15-year lows. This deterioration in quality and corporate profits can broadly be attributed to a capital expenditure cycle that has experienced a five-year downtrend, and more recently, the short-term speedbumps arising from the one-two punches of demonetisation and Goods & Service Tax (GST) reform. One common thread in my various company meetings was that the impact of de-monetisation and GST had been digested by the market, and would not present further headwinds. While this has yet to materialise in the form of earnings beats, it may suggest that the trend of negative revisions could abate. Regarding de-monetisation, the recently announced recapitalisation of the public-sector banks could potentially serve as a floor to capital formation. The calculations suggests that, while the scale of the infusion will help to shore up balance sheets, there will be limited leftover capital to spur large-scale lending3. As evidencebased investors, we will be keeping a keen eye on any potential improvements in quality and earnings, which could ultimately lead to more palatable valuations. Where is India in the CRIC cycle? 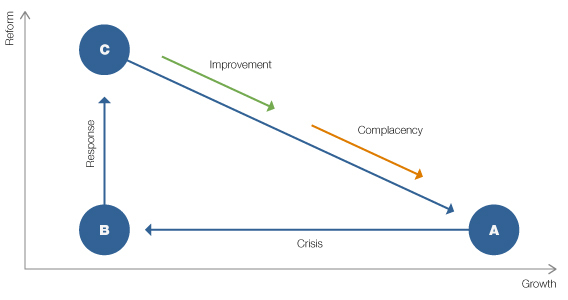 We have previously written about the ‘crisis-response-improvement-complacency’ (CRIC) framework2 as a behavioural model to appreciate market cycles in emerging markets. Modi’s reforms – be it de-monetisation, the simplification of taxes through GST, a more prudent property market underpinned by the Real Estate Regulation Act (RERA), or the banks recap – all point to a market that is jockeying between the response-improvement stages. My company meetings reinforced this. The trip amply illustrated some of the insights that can be gleaned when you think about the world using a 4Factor™ framework, which is a combination of an objective stock screen (directing our analysts to a high-scoring subset of ‘good ideas’), from which a rigorous fundamental research process selects the best ideas for our portfolios, all bounded by a coherent and strong risk process. What’s the outlook at sector level? The feedback from private-sector banks was consistent: the recap plugs a hole, and any uptick in competition is 2-3 years away. Industrial activity and the private capital expenditure cycle, as per Larsen & Toubro, shows limited signs of improvement, with any real recovery likely to be 24 months away. However, cement companies Grasim and Ambuja outlined a more upbeat medium-term outlook, underpinned by an uptick in demand from affordable housing in Tier 2-3 cities (6% growth p.a. over the next 3 years) vs. tighter supply additions owing to industry consolidation (3% growth p.a.). While the affordable housing theme was endorsed by developers DLF and Prestige, their exposure to mid-highend residential property continues to be a drag in the wake of demonetisation and PM Modi’s Real Estate Regulation Act (RERA). Implemented this year, the RERA aims to protect homebuyers. Crucially, developers now have to deposit 70% of revenues from pre-sales into an escrow account until a project is completed, thereby increasing accountability. Weak prices, lacklustre volumes and rising inventories are leading developers to diversify away from residential and towards office assets, while also deleveraging balance sheets. As for consumer companies and car/ motorcycle manufacturers, the consistent messages were that the impact of de-monetisation had been fully digested, paving the way for 3-5 years of high single-digit/low double digit growth. In the telecoms sector, India has experienced significant disruption in the past 15 months owing to the entry of Jio (Reliance Industries) and its eye-catchingly cheap plans – 50 rupees for 1GB of data at the time of launch in September 2016 made it the lowest data tariff globally. While this has weighed heavily on industry profitability, Jio recently ended its free offering and has successfully migrated 140m subscribers to paid plans. This speaks to its fiscal year’s target of capturing 50% market share while doubling earnings from current levels to >50%. Further evidence of more rational behaviour, coupled with the impending industry consolidation to a three-player market, could serve as potential drivers of better future profitability – clearly an area worth monitoring. Finally, after a weak 18-month demand environment, Indian IT services companies expect to see a pick-up in growth rates driven by normalising banking, financial services and insurance and retail (BFSI) verticals, and further margin improvement from higher utilisation and reducing mid-level management. 3 A total infusion of INR2.1tn, estimated bad loans of INR10tn, provisions of INR4tn and hence a provisioning shortfall of INR2-3tn assuming a 30-40% recovery rate of bad loans, vs. a book value of INR4.7tn and operating profit of INR1.5tn/year.